I'm learning this amazing piece of music from Nikolai Kapustin ... although I already play it well (kind of, at least most of it), I'm still unsure about some parts... so I decided I should ask someone. The problematic thing is the 8vb ... the -1 octave shift. I don't know whether the shift applies for the left hand only or for both hands since the right hand is playing in the bass key too. But I have always thought that 8vb for one hand applies for that hand only. With that logic, it would be played like this. Think of ottava shifts as of a clef change: where 8vb starts, imagine it's actually a switch into the bass-8 clef, where it ends, the clef switches back to bass (bass-0). Clefs apply to each staff separately, so do ottava shifts. So your yellow notes are (in order in which they're marked): <a1 a0> a2 a3 c#2 f#3. I'm not sure how would I play it, the c#2 could be easily played by LH with the help of a pedal, to avoid the quick jump a3 c#2 in RH. As a side note: It of course doesn't matter which hand plays it; it only matters on which staff it's written. My bet is on the 8vb only applying to the left hand. The A1 in the left hand is supposed to be held, and if the right hand would then play another A1, this would disrupt the holding of the left hand A1. 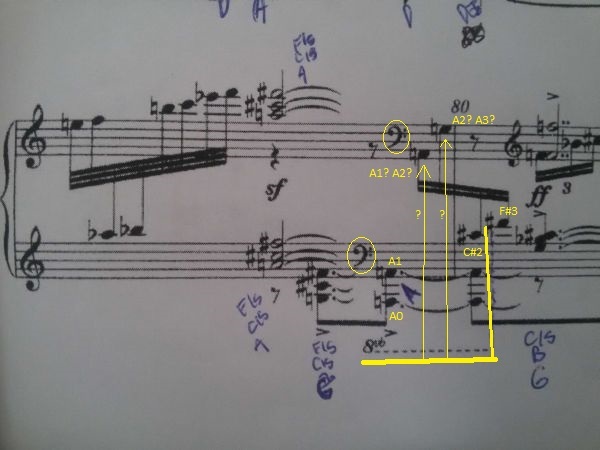 While this kind of disruption for voice-leading purposes is not rare in piano music, in this instance it would cause an imbalance in the decay of the left-hand A1 with the left-hand A0 which does not get a similar "refresh". But even without such a hint I'd lean towards letting the 8vb only apply per-staff. There is no point in not writing another 8vb when required for the right hand as well. Not the answer you're looking for? Browse other questions tagged piano notation sheet-music octave or ask your own question. What should a good acoustic piano feel like? How do I put the joke into the music?